ONCE somebody asked Bhagavan, "Why don't you visit places and guide people on the right path as Sankara and some others did?" Bhagavan: Merely being physically alive is itself an act of grace of Mahatmas. Even if they keep quiet, the vibrations set off by the power of their tapas [?] spreads harmony and peace. The question itself was inappropriate in the first place. Divine beings come into the world with a purpose and no distractions of their mission are desirable. The Maharshi's abidance in the Self was intended to demonstrate the importance of experiential knowledge as distinct from mere bookish knowledge. The desire for experiential wisdom depends on one's samskara and there is no use trying to inspire those who do not desire liberation. Further, mouna-upadesa is best. That subtle power touches the subtle body of the seeker and influences his samskara. Instead of preferring this why look for speech which is gross? electric light if it is asked to provide breeze." Each person had an allotted role to play, that was what Bhagavan meant. "If I start out to visit a different place to see devotees, on the way there will be several halts and it will take a long time to reach the destination," said Bhagavan. To a young girl who pleaded with Bhagavan to visit their place, Bhagavan said, "If you take me to your place won't all those devotees who come here be disappointed? Won't they also say that they would take me to another place?" It is not as if everyone desired liberation. A number of persons visiting Bhagavan were filled with sorrow. For those who sought refuge at Bhagavan's feet in view of their mundane affairs or health problems what was the use of any upadesa? Even so, the diseased and the agitated were given some peace which was a source of solace for them. Yet others visited him to show off their erudition. On such occasions Bhagavan simply observed mouna [?]. Like the clouds of autumn, which did not bear any water yet thundered they also would talk for some time and depart. In fact, Bhagavan himself said that exhibition of perverse scholarship was abundant in several commentaries. He also said that though there were several sayings supportive of advaita [? ], people interpreted them as being in favour of Vaishnavism. For instance, in one case, Nammalwar's saying: "Oh Lord, without knowing your true nature I thought you were different from me. But after knowing you, only you remain." Simply put, this is supportive of advaita [?] but commentators made perverse interpretations, said Bhagavan. Some were too lazy to read any scriptural text. They came to Bhagavan for clarifications on simple matters which could be got by reading any elementary spiritual text. But they would want a reply straight from Bhagavan, no less. But Bhagavan used to oblige them patiently. In yet other cases, devotees would seek clarifications on points noticed in some books. Bhagavan would make matters clear to them easily. Some did not want any discussions and even after various types of sadhana [? ], made little progress which was due to their worldly desires. Unless that abated, any spiritual enquiry was a waste. And yet to be rid of desires how many births did one need? Bhagavan did not discourage his devotees. In his view, complete freedom from desire meant acquisition of jnana [?]. Unless one abided in the Self, complete vairagya [?] and disappearance of desire was impossible for anyone. But a question often arose whether there was any prescribed level of vairagya [?] for self enquiry. 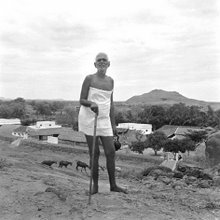 Bhagavan's reply to Natanananda revealed his attitude in this regard: "If you really are unfit why did the desire to visit Mahatmas arise in the first place?" In other words, the very arising of a good intention was enough of a qualification. Bhagavan's view also was that vairagya [?] could result from self enquiry. All seekers needed vairagya [? ], and it had to be obtained. technique of "neti-neti" or asking yourself, `To whom are these desires arising?,' in the self enquiry path, uproot the evil desire. It will fall along with branches, leaves, flowers and buds." Sri Ramakrishna looked upon his spouse as the Mother of the Universe and escaped the hold of desire. Similarly after savouring Bhagavan's sweet name who would prefer to seek the sweetness of any other thing? Bhagavan's teaching was simple: pay no attention to anything except the atma. No one need doubt its efficacy. There were any number of devotees who after a prolonged and futile struggle surrendered themselves to Bhagavan and got out of the mire. For vairagya [?] to intensify there were various aids like, japa, homa, satsang, association with Mahatmas  as also keeping up regularity, said Bhagavan. But all those should be within certain limits as means to an end and not as hindrances to self-enquiry itself. dry the split pieces of bamboo or other wood, clean the leaves and then stitch in order to keep them together. Having done so, you are not going to throw them away immediately isn't it? You throw the leaf away only after you have had your meal." The upadesa here was that the body could not be discarded until it had gone through all experiences ordained for it. Bhagavan certainly was aware that the ideal in life varied according to the individual's stage of development and vasanas. Accordingly there were instances where Bhagavan approved of worship of God with a form in some cases. Taking this as a cue worshippers of Sakti took Bhagavan to be one among themselves. Vaishnavites felt that there was no difference between their own beliefs and Bhagavan's upadesa. It was similarly possible for Christians to believe that what Bhagavan taught was no different from their own tenets. Generally Bhagavan never tried to wean away anyone from the path already being followed by him or her. Bhagavan held that whatever path was being followed, ultimately everyone would reach the stage of enquiry into the Formless and said as much. Bhagavan reminded one of the precept: "Act according to the other person's views and captivate him." Bhagavan also did not approve of persons with different beliefs quarrelling among themselves. So long as worship of God with a form was there this conflict was inevitable. by the poet Arunagirinathar visited Bhagavan along with a group of lawyers. They were all adepts at singing those lyrics. Murugan could sing the lyrics excellently and with emotion but did not know their meaning. Thereupon Bhagavan explained to him what the lyrics meant. Murugan came to know the meanings of the lyrics for the first time but soon became an expert in Tiruppugazh and was able to give discourses. Thus Bhagavan helped him in his worship of God with a form. One of the lawyers who came to Bhagavan asked him if chanting the Gayatri mechanically had any use. Bhagavan told him, "Chanting mechanically also is useful. One can take Savita as the subject to be meditated upon especially when reciting the last mantra, `salutations to Savita the universal eye'." and surrendering to Him will help the meditator a lot. That Sakti knows what is good for the meditator and bestows it. Also meditating continuously on that form which is all-pervasive will lead to the form itself disappearing. It ends in the worship of the Formless. you worship. To be able to see that form in everything is a big step forward. At that stage `everything is full of Vishnu'. The worshipper also is a part of `everything'. To be able to see Vishnu alone is the next big step. After that a stage arises where there is only tejas, beyond that lies the primal sound, beyond that is akasa. What lies beyond that and where lies multiplicity can be considered later. You said that the ideal was Vishnu. To be able to see Vishnu nama everywhere is the achievement. The nama arises in us as a thought. In other words, when you perform nama japa in the mind that nama is in the form of a thought. To have one and only one thought is the last step. I refer to it as `aham [?]'. Names like Vishnu depict characteristics whereas for `aham [?]' even that is absent. Krishna Bhikshu once submitted to Bhagavan, "Bhagavan, previously while meditating, your form used to appear before me. But now that is not happening." Bhagavan replied, "At least is the name remembered?" "Yes, certainly." "Name is beyond form," declared Bhagavan. A Vaishnavite asked Bhagavan very reverentially, "Bhagavan, is Truth dvaita (dualistic) or advaita [?] (non- dualistic)?" Bhagavan in turn asked, "Do you refer to the present stage or to the stage when the world is not." "To the present." "At the moment, you and I are very much here." "What happens after the world submerges?" "In what?" "In paramatma." "After it submerges, there is no world, isn't it? There is only paramatma." "How do we get that experience?" "What is your experience in deep sleep? There is no world in it. Were you there alone or as two or three?" asked Bhagavan. The visitor had no reply. For some, the chosen deities were avatara purushas like Sri Rama. For some others it was Sakti. In such cases the power of Sakti flowed to the upasaka and his mind became one with Sakti. That Sakti itself gave strength to the seeker for meditating on the Formless, clarified Bhagavan on one occasion. Bhagavan would suggest appropriate mantras for meditation to disciples after finding out their priorities and preferences. Observe what Bhagavan said to Ganapati Muni regarding the practice of mantra japa "In Upadesa saram performing japa is referred to. In japa too there are different ways  performing it aloud, performing it in a low voice or performing it silently in the mind, each better than the preceding method. Keeping the attention on the person performing the japa is known as ajapa." In the case of worship of the One with form Bhagavan also, like acharyas of the past, approved of bhakti [?] and said that uninterrupted meditation was better than meditation in spells. emphasized that whatever be the method adopted what was important was the realization of the Self. Bhagavan's grace helped each seeker according to his deserts. So far as Bhagavan was concerned, all sadhana [?] practices were equally good. What did it matter if the upadesa varied according to the disciple? For practitioners of yoga, brilliant lights in different shapes and colours were visible. So also forms of chosen deities were visible and all kinds of sounds were heard. It was common for seekers to see Bhagavan in the form of a brilliant light also. Santammal, a widow, came from Ramanathapuram to serve Bhagavan. She worshipped Bhagavan's picture with great devotion and always meditated on Bhagavan during waking hours. Naturally, she also saw him in her dreams. Occasionally, she saw Bhagavan's form as a bright light whether her eyes were open or shut and this happened even if she was at Arunachala. She narrated her experiences to Bhagavan who told her that these visions were not important and that only realizing the Self mattered. What we saw in the waking state in gross form could also be seen in a subtle form by the subtle mind in dreams, yet all these were mere objects and not the subject, which was more important. To rejoice at such experiences was utter foolishness emphasized Bhagavan. Similar are occult powers, and siddhis, about which we shall speak later. numerous ways some were still dissatisfied. They aspired to be known as Bhagavan's sishyas (disciples) but Bhagavan never gave diksha to anyone nor did he accept anyone as his sishya. It was enough to obtain his grace and he always assisted devotees in the spiritual path by his presence or a look. Chadwick once asked Bhagavan if he never gave initiation by touch nor accept some as his disciples. Bhagavan replied, "What is the need to demonstrate? Without touch don't you get the feeling of being accepted?" In fact, everyone knew within himself whether he was accepted or not but no one could claim to be Bhagavan's sishya or that what they said was Bhagavan's view also. Devotees would discuss Ulladu Narpadu among themselves and interpret its views in various ways but would not come to any agreed interpretation. They then approached Bhagavan for an authentic clarification. Bhagavan heard them and merely said, "Nothing has been written with any sankalpa [?]. Your interpretations are alright." Actually, each one understood the verses according to his samskara and the benefit derived also depended on their understanding. Even if anything more were to be taught to them it was all of no use to them. On one occasion, two devotees gave different interpretations and not satisfied with it, continued their discussion through the pages of a journal! upadesa. Further any initiation could happen through visions as in the case of Natanananda, or through sight as in the case of Ganapati Muni, or through the touch of the head as in the case of Ramaswami Iyer and a young Maharashtrian woman. From various bhaktas we learn that Bhagavan appeared in their dreams and gave upadesa. Any doubts raised about matters in the sastras [?] would elicit replies beneficial to everyone. On some occasions even if any request for a clarification was not articulated the clarification came about in a general way. Bhagavan gave his upadesa, on numerous occasions, by means of brief statements. Once, a young girl was moving from one window to another in the hall frequently and every time she moved Bhagavan asked her what she was doing. The girl would reply "Nothing." Thereupon Bhagavan said "That girl knows that only her body moved and that she did not move. Elders never know this." A devotee once said, "Bhagavan, you don't do anything. Give me your power I will do a lot of good to the world." "Is it so?" And turning to others present Bhagavan continued, "here is a man who has no wherewithal to feed himself but wants to run a charity home!" Bhagavan gave a similar answer to Humphreys. A gentleman who had a newspaper in his hand asked Bhagavan: "It is said that the atma is everywhere but it is seen no-where. Where exactly is it?" "You have a newspaper, you see the letters there but not the paper. On that account do you say that there is no paper at all?" While serving food one server spilt something on somebody's feet. Bhagavan noticed it and remarked, "The moment they take the ladle some think that they are great but they don't see who is really great." A disciple once asked Bhagavan, who was then at Skandasramam, "What is meant by desireless action?" Bhagavan did not give a reply but kept quiet. A little later, he went out for a walk accompanied by the questioner and some others. Bhagavan saw a branch of a tree, cut it and spent one hour shaping it into a nice walking stick. At about that time, an elderly shepherd who had no walking stick came that way walking slowly and with difficulty. Bhagavan gave him the stick which he just made and said "Action is over so also desireless action" and thus showed by example what the phrase meant. Bhagavan's words were pregnant with upadesa. To be able to receive it depended on the hearer. The example to be followed was Bhagavan's way of life. Whatever he did was perfect and an example for others to follow.